Dominic Langdon has given Solihull Moors a boost by announcing he will return to the club for the start of the new season. SOLIHULL Moors FC, members of the Conference North League, will be joined by Solihull Borough Girls FC and their nine girls teams, including two open-age ladies teams. 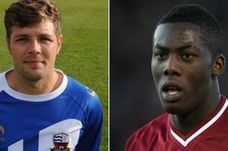 Solihull football player in line for football league club sign up. A TALENTED amateur footballer from Solihull has been shortlisted in a nationwide competition to win a professional player contract with a football league club. NEW store Leekes of Coventry, which is set to open towards the end of the summer 2012, has saved Triumph Meriden Football Club from folding, after a last-minute sponsorship deal was agreed last week. SOLIHULL Moors FC have secured a sponsorship deal worth more than £100,000 over three years. THE chairman of Solihull Moors Football Club - currently riding high in The Blue Square Bet North division, is urging local people to come on down to Damson Park and take a look at what they are missing. SOLIHULL Moors had their best week of the season - and moved further away from the dreaded drop zone - after they recorded two three-nil wins in a matter of days. A PROMISING young footballer from Solihull has signed his first professional contract, much to the delight of a top sports coach - and his dad! A signed England shirt has sold for £600 at a charity auction after it was donated to a Hall Green sports clinic. FORMER Solihull School youngster Will Grigg says his dream has come true after he was awarded his first professional contract at Walsall FC. THE playing squad have done all they can but now Birmingham & Solihull Bees face an anxious wait to discover their fate for next season. FOUR first-half goals set up an important win for Olton to move them four points clear of the drop zone with just three games remaining. TWO goals from Naomi James ensured Olton Ladies ended the first half of the season on a high. SOLIHULL Moors are hoping to tempt former Exeter City striker Jake Edwards to join them.